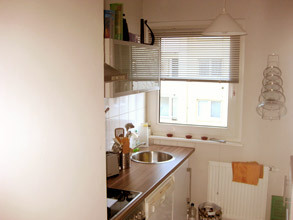 The fully fitted kitchen can be used for preparing meals. 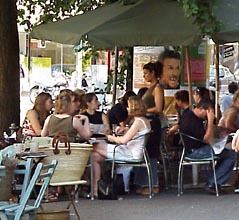 Die accommodation is located on Gaußstraße in 60316 Frankfurt am Main in the district Bornheim, Germany. 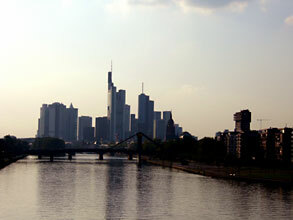 Click on the maps: hot-map and stadtplan der Stadt Frankfurt.
. The area is ideal for going out and shopping. On Saturdays there is a weekly market with the best brunch in the city. And if you wish to get away from all the hustle and bustle, the nearby von Bethmann Park" is the right place for a walk and to relax. 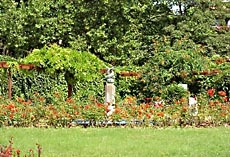 This is the place where old men play boules or chess with gigantic figures and young lovers sit on benches in the middle of a sea of flowers. This park is one of the citys best kept secrets. You will be pleasantly surprised. 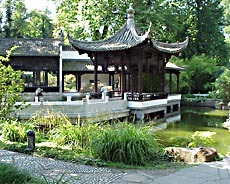 In the heart of the park there is a peaceful Chinese Garden (entrance free). 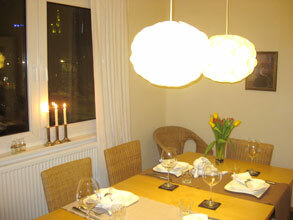 The apartment (63 m²) on the 2nd floor has tree rooms. One of the rooms is yours! It is approx. 14 m². 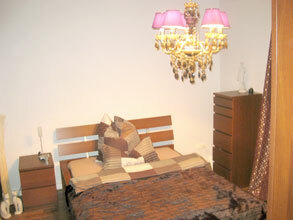 The bed (see picture top left) has one mattress and is 1.40 m wide. The fully fitted kitchen and bathroom can be used. Parking in front of the building is free of charge  if you are able to find a parking place which can sometimes be quite difficult. Transport connection is excellent. 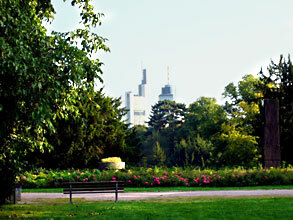 You can reach Frankfurt city centre and the fair and exhibition centre in just 10 minutes. The price does not include breakfast, but the kitchen can, of course, be used for preparing breakfast and there are numerous shopping possibilities and cafés offering breakfast (open from 7.00 a.m.) close by. Unfortunately, pets are not allowed. This is a non-smoking apartment! 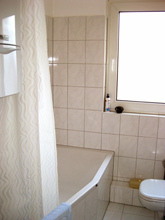 This room made available by Privatzimmer Sens, Agency for holiday apartments and guest rooms in Germany.